According to the legend, this style is said to have been practiced successfully by a woman and, after four generations, came to Yip Man, who taught in Hong Kong until his death in 1972. 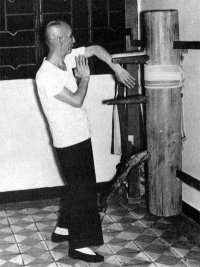 Wong Shun Leung, undeniably the most successful fighter among Yip Man’s pupils, was instrumental in the development of Ving Tsun in Hong Kong. Through his student Philipp Bayer, Wong’s Ving Tsun reached Europe in the 80s and since then has enjoyed increasing popularity. Ving Tsun has been solely developed to survive in combat. The philosophy of this coherent system involves all aspects of combat, such as strength, balance, simultaneity , timing, sense of distance and assertiveness. The system aims to end a fight as quickly as possible in a highly dynamic yet economic and effective way. Ving Tsun wakes physical and mental potential. Ving Tsun is based on comprehensible, at all times explainable, scientific knowledge. If you are interested to learn this unique and fascinating martial art from scratch, you are welcome to do so. Ving Tsun is a devastating fast fighting art of great practical value. It is probably one of the most efficient and most logical systems of close combat, ever devised. You are welcome for a free trial lesson!